The Nightmares headed north on Saturday to Kerikeri’s Bay Sports Stadium for our Halloween Havoc bout – the last home game of the season – owww, this year has gone soooo quick! Our Derby Bratz logos – thanks to our fab designer Blondini! Next our four fantastic freshies got to pop their Derby cherries when Voodoo Vixens took on Trick or Beat’rs! It was a tough game with lots of spills on and off the track and some really gutsy jamming and blocking from the newbies – final score 121-100 to the Voodoo Vixens! Thanks to all at Bay Sports Stadium, the refs, NSO’s, our MC “Queen” Taste of Hell, the ladies on the door and to our supporters who travelled from near and far to watch us – let’s hope we’ve gained some new derby fans in Kerikeri! 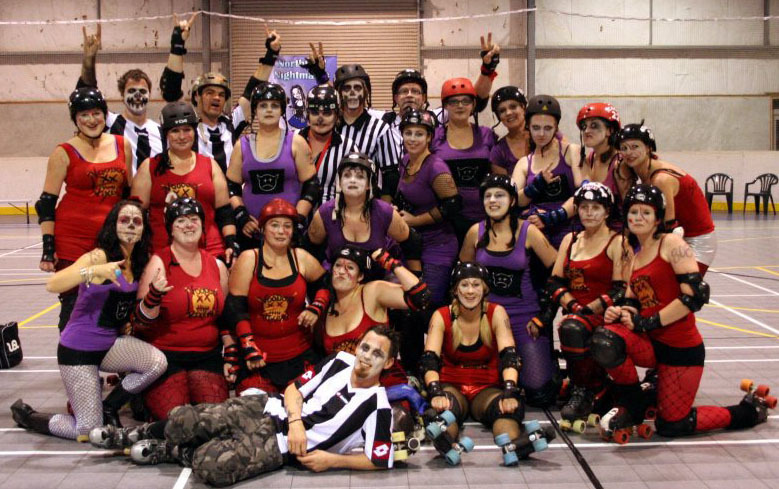 Voodoo Vixens, Trick or Beat’rs and Z Squad celebrate our last home game of the season! This entry was posted on November 1, 2011 by nnderby. It was filed under EVENTS! and was tagged with bay park stadium, Children of the Corn, halloween havoc, Northland Nightmares, Northland Nightmares Roller Girls, Northland Nightmares Roller Girlz, Roller Derby, rollerderby, Satan's Minions, Trick or Beat'rs, Voodoo Vixens.